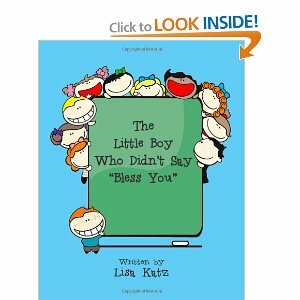 I was contacted by Lisa Katz to do a review of her two books. They are really short so I decided to combine the reviews into one. The first one I read is for very young children. “The Little Boy Who Didn’t Say Bless You”. It attempts to get children to learn to say bless you when someone sneezes. The illustrations will grab a child's attention. I honestly feel she should have added something about covering your nose and mouth when you sneeze but it is a good start. Although she does not put this in the book (after all this IS meant to be read to or by young children)-I would like to add that the reason people say Bless You is: when people sneeze they stop breathing—thus the Bless You!! This is a story about manners and what it means to be considerate. This is a common phrase that is said after someone sneezes. One day in school, Bobby’s classmate sneezes, but he doesn’t know that it is polite to say “bless you”. Who knew you could learn so much from two little words! The second book celebrate all us women and what we go through buying JEANS-the book title is “Jean Expressions” It is a compilation of various very funny and sadly very true things we women say when in dressings rooms trying to find a pair of jeans!! This is really short but I found myself shaking my head up and down agreeing and laughing!! The pictures are great that go with each comment made! Jeans have become am invaluable staple in everyone’s wardrobe. However, shopping for the perfect jean can truly be a disaster! Women especially love to talk with other women about theor dressing room and shopping experiences. Here you will find a compilation of comments that either I have made, friends or family have made, or that have been overheard while trying on jeans. It’s always more fun to share your experience with others—especially the funny ones! Lisa Katz grew up primarily in South Florida. She earned her Bachelor’s degree in English from the University of Florida and continued her education to earn a Master’s degree in Reading a couple of years later. In 1993, Lisa and her husband moved to Pittsburgh, PA where she worked as a Literary Specialist. A few years down the road, she embraced her role as full-time mother. It was during this time that she began writing her first children’s book. Lisa and her family moved to Charlottesville, Virginia and lived there for 10 years until recently settling into Gainesville, Florida in January 2012. Coming back to Gainesville after a 20 year hiatus has been a wonderful experience for Lisa. 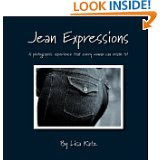 Jean Expressions is Lisa’s debut women’s book. She has written a feature length screenplay as well as published a children’s picture book, The Little Boy Who Didn’t Say “Bless You”. Look for more women’s books and children’s books from Lisa in the near future. Lisa`s web site and blog at http://lisakatzbooks.com. You can also now follow her on Twitter: @LKatzBooks. I received both of the above titles in PB form for review purposes only. All opinions expressed are my own honest opinions. For more information please check my Disclosure Statement. Our giveaways are in no way sponsored or promoted by Facebook. I blame fitting room mirrors! :) The Bless You Book sounds interesting. I'm with you though....it would have been neat if she would have let kids know why that originated! I would love to read the one on jeans, I could imagine what comes out of some peoples mouths as I know what I say when I try them on, lol! I am unsure on the teaching kids to say Bless You, I used to always to it until someone yelled at me because they were of a religion that did not appreciate it and it was not a short conversation, it was a long one on how rude I was to assume that everyone would want it. Now I do not say it unless I know someone really well. Oh my gosh the Jeans book sounds hilarious! I would love to read that! I myself have said some funny things when trying them on. I love books about manner for little kids. You can tell them and try to teach them, but when they get to see it in a book it's almost like they believe it more than when you just say it, the jeans expressions does sound funny. Just sitting here thinking of all the things I have said or though while jean shopping makes me smile. Great reviews! The books were interesting, the first one would make a good start reading book for the kids, it will teach them some value in everyday life. The 2nd book seems to be funny, I truly feel how all the quotes or sayings when a woman tries a pair of jeans. She sounds like a very talented writing. I will have to check into her work. That jeans book is definintely an attention grabber though. Will look around Amazon for a copy of this since it shows a picture of it within the article. The bless you one sounds cute! I love children's books! !